FDA: Assuaging a Guilty Abortion Conscience or More Deception? What does a regulatory agency do when it has betrayed the public they are sworn to protect, through the deliberate flouting of hard-won stringent, safety-testing protocols? Create an award in the name of a 96 year-old heroine who set those standards a half century ago, then trot her out in a ceremony today and make her its first recipient. This is precisely what is happening today, as reported in yesterday’s New York Times. FDA commissioner Dr. Margaret Hamburg is honoring Dr. Frances Oldham Kelsey with the newly minted Kelsey Award. In a move that is layered with unfathomable levels of irony and rank hypocrisy Hamburg (who helped shepherd the new abortifacient Ella through the regulatory process as merely a “contraceptive,” and flouting an appalling number of safety inquiries) is honoring the woman who saved countless American babies circa 1960, myself included, from the ravages of thalidomide. It was Kelsey who defeated William S. Merrell Company’s application for thalidomide in the United States by linking the drug to the hideous birth defects it induced in embryos of mothers taking the drug for morning sickness. Read this blog’s two part series on Hamburg’s shameful and unethical role in Ella’s approval here and here. The answer can only be that FDA is either assuaging a guilty conscience, or creating the public perception that they value the very thing they have for two decades seriously degraded. In more pithy and enlightened circles it’s called hypocrisy: pretending to be that which one has no intention of ever being. The juxtaposition of the recent Ella approval and labeling process and the public appeal to Dr. Kelsey’s great scientific and ethical virtues leave little doubt that Hamburg’s motivation is both the assuaging of a guilty conscience as well as rank hypocrisy. 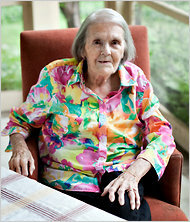 It is also a breathtaking example of cowardice, the using of a woman nearly one hundred years old, and her great work in exposing the thalidomide scandal, as a smokescreen for FDA’s increasingly cozy relationship with industry and its recent betrayal of women and the 2 percent of babies who will survive Ella exposure, with absolutely no studies performed on the teratogenic effects of Ella on them. The great difference in fifty years is that Kelsey began her work at FDA thirteen years before Roe v. Wade, in a time when the drug being ingested by women was being taken because these women wanted their babies and wanted as smooth a pregnancy as possible. Hamburg, fifty years later, shepherded an abortifacient around Kelsey’s stringent safety testing regulations. But these babies don’t matter because they are unwanted from the outset. Their fates really don’t matter much. Evidently, their mothers matter little more. I have long admired Dr. Kelsey. My younger siblings and I owe her much more than could ever be expressed in words. 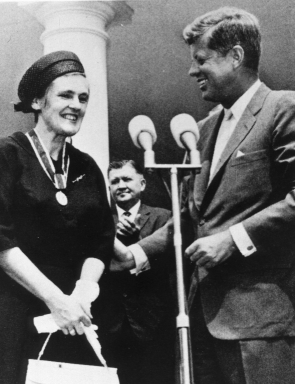 Her 1962 Distinguished Civilian Service Medal, awarded by President Kennedy, was richly deserved. She is a great woman who made her way at a time and in an environment that was extremely hostile to women with Ph.D.’s in science and medicine. Now at the twilight of her life, she deserves a much better fate than a cynical award, cynically awarded by a woman who has repudiated through her administration of FDA all that Dr. Kelsey worked so hard to build. Perhaps, after much avoidable human misery FDA will yet come back to an appreciation of Dr. Kelsey’s vision, and return as an agency to its senses. In so doing it will have removed the stain of dishonor from this award that bears the name of one of the great pioneering women of science. I wonder if Dr. Kelsey had any comments about the FDA’s hasty approval of RU-486. Dr. Nadal, I’m pointing to your article, Down on the Pharm. Great catch of the FDA remembering when it was worth something.